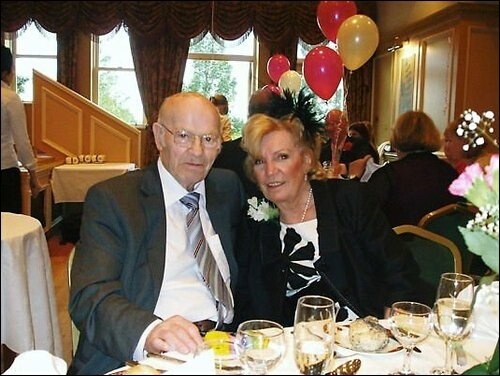 Betty Henry with her husband John at a wedding last year. A PENSIONER was left in the freezing cold waiting for an ambulance after tripping and breaking her ankle, despite passer bys making SIX 999 calls. It was over an hour before help finally arrived for 75-year-old Betty Henry, who had just got off the bus before tripping on a pothole on Clermiston Road in Edinburgh. Members of the public who rushed to her aid were repeatedly told by the ambulance that it was not “an emergency”, despite the fact that the usually active pensioner could not move and started to shake in the cold. Meanwhile, Mrs Henry’s daughter Barbara Balfour, was waiting to hear which hospital her mum would be taken to before setting off from her Haddington home. It later emerged that Mrs Henry had broken one ankle in three places and sprained the other one. The family are angry that it took the emergency services so long to reach their elderly relative, but praised the medics who finally arrived. Mrs Balfour said: “The paramedics who came were lovely and I cannot thank the people who waited with my mum enough – all the family really appreciates the help they gave. “The people who lived in the flats across the road were coming back and forwards with hot water bottles to keep her warm. “I hate to think what could have happened if they hadn’t stayed. Veronique Dron, 40, was passing when she saw Mrs Henry fall. She and her colleague rushed to help, and were disgusted by the way the ambulance service reacted. She said: “It was horrific to watch. She was screaming and crying with the pain yet we kept on being told that she wasn’t an emergency as she was able to talk. “We were told to ring back if she became unconscious. “It was undignified for her to have to lie there like that, with two possible broken or badly damaged ankles and a possible broken hip. The OAP complained of “burning ankles” and a sore hip as she lay shaking on the ground after her fall just before 10am on Tuesday. Six kind-hearted passer bys stayed with her, including a nurse and two qualified first aiders who repeatedly voiced concerns to 999 crews that they though the woman was showing signs of hypothermia. Temperatures in the area were a freezing -4c and Mrs Henry went into suspected shock. But the helpers didn’t want to move her in case they hurt her even more, so a resident from a nearby house provided a blanket and hot water bottle. It was only when Ms Dron’s colleague Geoff Hunter, 53, dialled 999 for the sixth time and demanded to speak to a supervisor that the case was ruled an emergency. A crew arrived ten minutes later and Mrs Henry was taken to the Edinburgh Royal Infirmary, where her daughter and granddaughter were already waiting for her. Mrs Balfour, 55, said: “My sister in law got a call from one of the passer-bys and she phoned me. “We were getting ready to go up to meet her but had to wait around at home to find out where they were going to take her. “Eventually we got told they would be going to ERI. “We were there waiting absolutely ages just talking to the various ambulance drivers who were coming in. The pensioner’s granddaughter, Caley Balfour, said that her normally active gran was finding it hard to cope cooped up in hospital. But she praised Andrew Glass, one of the paramedics who picked up Mrs Henry. Miss Balfour said: “If all NHS staff were like him it would be a lot better. He kept going away and coming back with information about my gran and updating us all the time. He was absolutely brilliant. “She is so independent. She’s a techy gran, very interested in computers and technology. She’s a very active lady and so this is the sort of thing that will give her a downer. Mrs Henry is still in hospital and was due to undergo an operation on her ankle. But doctors decided it would be best to wait and see how the bones healed before they carried out any surgery. A Scottish Ambulance spokesman said: “On two occasions, ambulances dispatched to the incident had to be diverted to immediately life-threatening calls.